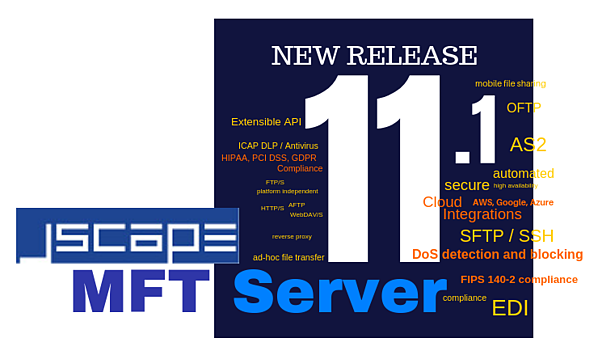 JSCAPE, the leader in platform and protocol independent managed file transfer solutions, is pleased to announce the latest release of MFT Server, 11.1. • Added reverse proxy and trading partner support for Microsoft Azure File Service and Google Storage protocols. • Added support for Java versions 9 through 11. • Added support for KMS bucket encryption when using Amazon S3 trading partners and reverse proxy. “Cloud integration continues to be one of the leading requirements we hear from our worldwide customer base. Deployment flexibility has always been at the foundation of all our products and this release allows our enterprise customers the ability to select the deployment architecture that best meets their business requirements. Customers can now deploy without compromise in an exclusive on-premise architecture or an exclusive cloud environment or in a mixed use, hybrid cloud architecture” said Van Glass, JSCAPE CEO. About JSCAPE - JSCAPE is a leading provider of enterprise wide, platform-independent and easy to use managed file transfer solutions for on-premise, cloud based or hybrid cloud environments. Since 1999, JSCAPE has been providing simple solutions to complex file transfer problems for 2,400+ customers in over 50 countries worldwide. JSCAPE MFT Server is a platform independent managed file transfer server that centralizes and automates business processes around file transfer events into a single easy to use application while providing users with speed, security, reliability and compliance. JSCAPE MFT Server supports all major file transfer protocols including AS2, FTP/S, SFTP, SCP, OFTP, TFTP, HTTP/S, WebDAV and AFTP (Accelerated File Transfer Protocol). To learn more about JSCAPE products, please visit www.jscape.com or contact us on +1.786.375.8091 or at sales@jscape.com.